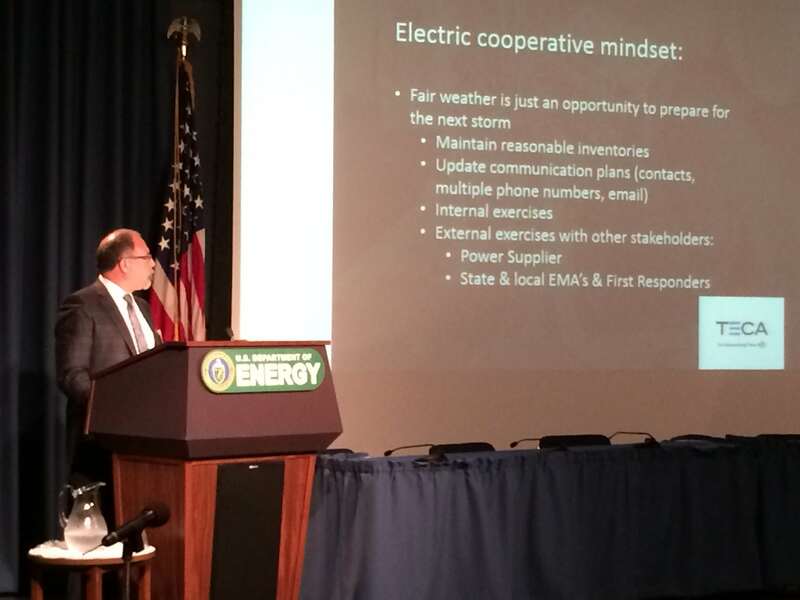 WASHINGTON, D.C. – David Callis, executive vice president and general manager of the Tennessee Electric Cooperative Association, presented today during the Department of Energy’s Clear Path III, a hurricane preparedness and response event and exercise for the energy sector. Deputy Secretary of Energy Elizabeth Sherwood-Randall invited Callis to discuss the electric cooperative mutual aid process as part of a series of information briefs during the event. The objective of Clear Path III is to assess government and industry’s plans, policies and procedures at all levels to identify and improve response efforts. The Tennessee Electric Cooperative Association provides legislative and communication support for Tennessee’s 23 electric cooperatives and publishes The Tennessee Magazine, the state’s most widely circulated periodical. Visit tnelectric.org or tnmagazine.org to learn more. i hear that Mr. Callis did an excelllent job representing his state and his electric cooperatives.